Mr. Gilliland represents the Teamsters Local 396 in Los Angeles which is headed by its Secretary Treasurer Ron Herrera, recipient of the Cesar Chavez Leadership Award and President Jay Phillips. Mr. Gilliland provides the local with legal advice and its members with legal representation in personal injury and workers’ compensation matters. The Gilliland Firm, its attorney and staff are also supporters of labor in Los Angeles, Orange and San Diego Counties. They are supporters of the Orange County Labor Federation Solidarity Leadership Awards Dinner, Teamsters Unity Conference which benefits the Jimmy Hoffa Scholarship fund each spring in Las Vegas, Nevada and are regular attendees and supporters of the LAANE City of Justice Awards Dinner each December in Beverly Hills, California with past honorees including Los Angeles Mayor Eric Garcetti, California Attorney General Kamala Harris, James P. Hoffa, Sidney Poitier, Cheech Marin and John Densmore. The firm was also active in the walk against Wall-Mart in Chinatown, a rally which ultimately organized Republic Services, Inc. in Anaheim and the American Reclamation rally in support of their client Karla Campos. Karla Campos was fired by American Reclamation after she and some of her co-workers filed a complaint with Cal/OSHA. She complained that American Reclamation treats is workers worse than the garbage they work with, paying poverty wages with no benefits, exposing employees to health and safety hazards on a regular basis and firing workers who file safety complaints with Cal/OSHA. On May Day in L.A., waste haulers and sorters at American Reclamation were joined by more than 500 Teamsters and union members from across L.A. Labor, from teachers and grocery workers to carwash workers and film crews in support of their efforts to form a union. Margarita Castro, a waste sorter at American Reclamation, addressed the May Day crowd, telling them about the deplorable and dangerous working conditions at American Reclamation. She also said that some workers have been there for 20 years without a raise and are still making minimum wage. Recently announced 2012 Presidential Medal of Freedom recipient Dolores Huerta joined the protest. When talking about receiving the Medal of Freedom, Dolores Huerta stated boldly, “Freedom means workers must be free to organize.” She also talked about how bosses and CEOs have their own associations they belong to that represent their interests. They pay dues, so it is only fair that workers also have the same rights to have unions. 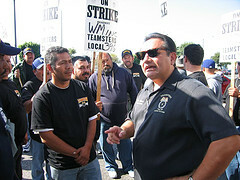 In response to the Cal/OSHA complaint, a U.S. District Court judge in Los Angeles subsequently ruled that American Reclamation must reinstate three fired workers who supported an organizing campaign, including Campos, and must stop threatening, intimidating and coercing all the employees, a huge victory for the 60 workers who are seeking Teamster representation. The NLRB sent its complaint to the District Court seeking an injunction under section 10(j) of the National Labor Relations Act to get the company to stop abusing its workers. In late May, the California Department of Industrial Relations’ Division of Occupational Safety and Health (Cal/OSHA) cited American Reclamation, Inc. for 36 safety violations that put the workers at risk while on the job. Cal/OSHA’s citations came closely on the heels of a complaint filed by the NLRB that charged American Reclamation with 13 unfair labor practices (ULPs) in connection with the workers’ campaign to join Local 396. The NLRB complaint, filed on April 30, included three ULPs for wrongful termination of workers by the company. “The fact that the NLRB, a state agency and the District Court all found overwhelming examples of major problems highlight how egregious this company’s violations have been,” Herrera said.